PsychOpen GOLD is operated by the Leibniz Institute for Psychology Information (ZPID) and publishes primary research in the field of psychology. PsychOpen GOLD is part of ZPID's open access publishing platform PsychOpen, which provides several different options for publishing scientific works. 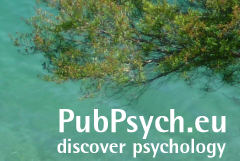 Read more about PsychOpen and about the journals published by PsychOpen GOLD.